First, I found a recipe for homemade teriyaki sauce. Sure you can also get this stuff at the store pre-made, but I’ve been trying to make as much stuff as I can from scratch (and avoid processed foods), plus, why would I go to the store when I have everything I need in my pantry? This recipe makes 1 1/2 cups of teriyaki sauce. I cut it approximately (and by approximately, I mean I really did eyeball it and do shifty math) into a third of the recipe since I only needed 1/2 a cup. 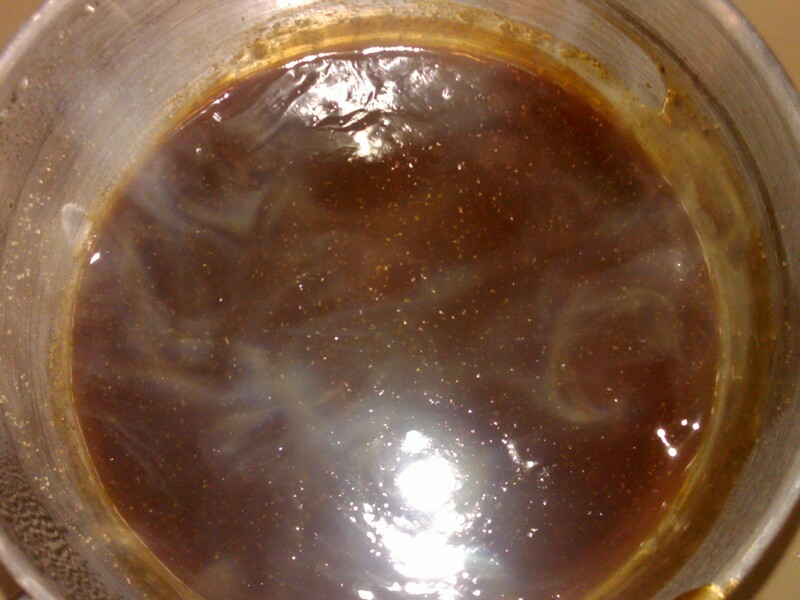 My simmering, just thickened teriyaki sauce. While my sauce cooled, I knew I divided up my 1 1/2 pounds of steak into three 1/2 pound portions (because there’s no way I needed to cook that much). I wrapped two of the portions plastic wrap, put it in a freezer bag and froze it. 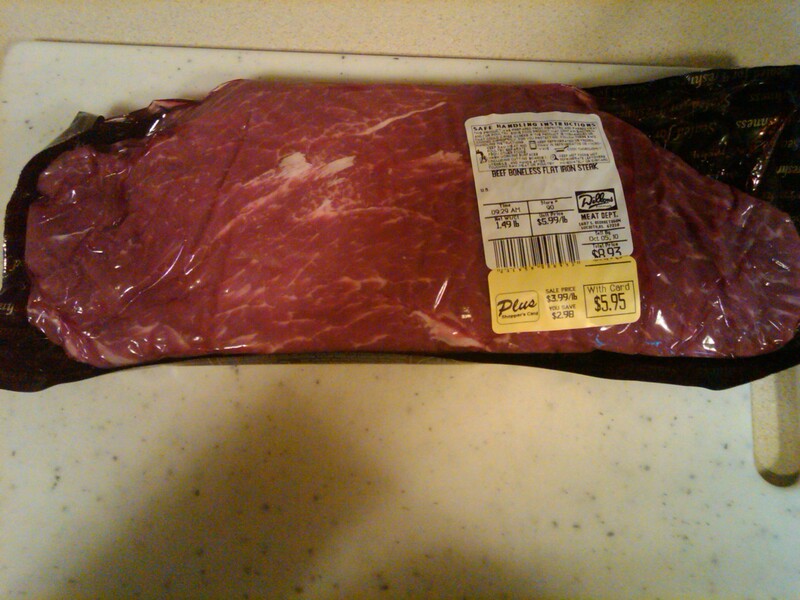 My very first flat iron steak, purchased on sale at Dillons! I also knew the marinade/glaze I was using called for onions, which I didn’t have. So I put 1/16th a cup of dried onions (found in the spices section of the grocery store) in with 1/16th of a cup of water. You have to let them sit for about 10 minutes. I’m sure fresh onion would have been better, but like I said, why go to the store when the ingredients are in my pantry? Then I went back to my kansas.com recipe. As recommended by the recipe, I cut away visible fat (as much as I could easily) and cut deep slits in the meat to allow it to marinate faster. I tried to cut my slits in the same fashion as I’d slice the steak later. Right into my pan of homemade teriyaki sauce, I added my re-hydrated onions, honey, sesame oil and minced garlic. The kansas.com recipe says to reserve 1/2 a cup of this, but the problem is you’re only working with a little over 1/2 a cup. I ended up reserving somewhere between 1/4 and 1/2 a cup. I put my steak in a plastic dish that was almost the same size as my steak. 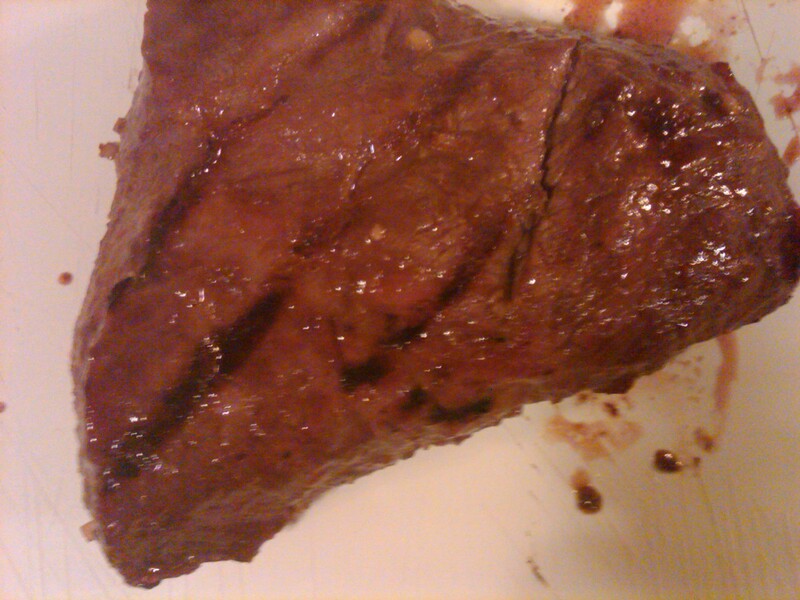 I poured the remaining marinade over it, flipping it a few times to coat both sides. Here’s the kansas.com marinade/glaze. Which is my homemade teriyaki plus a few additional ingredients (garlic, onions, honey, sesame oil). 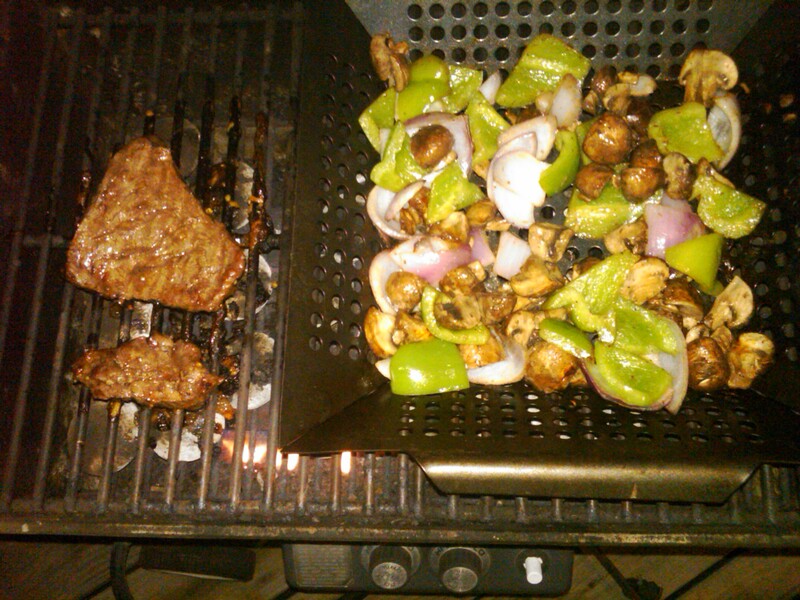 As my steak marinated, I cut up a green pepper and red onion. Then I realized I’d packed my skewers. And couldn’t find them. Dang it. 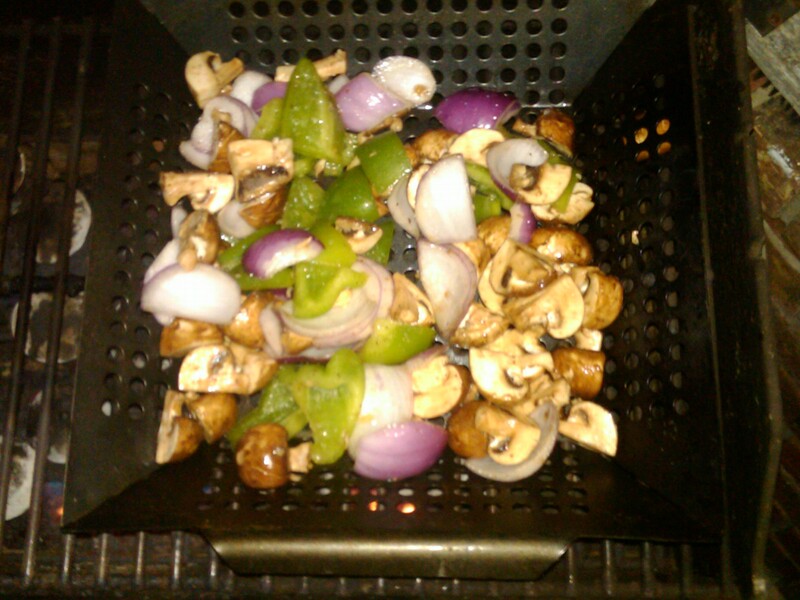 Luckily, I bought a vegetable grilling dish several years ago, so I pulled it out. 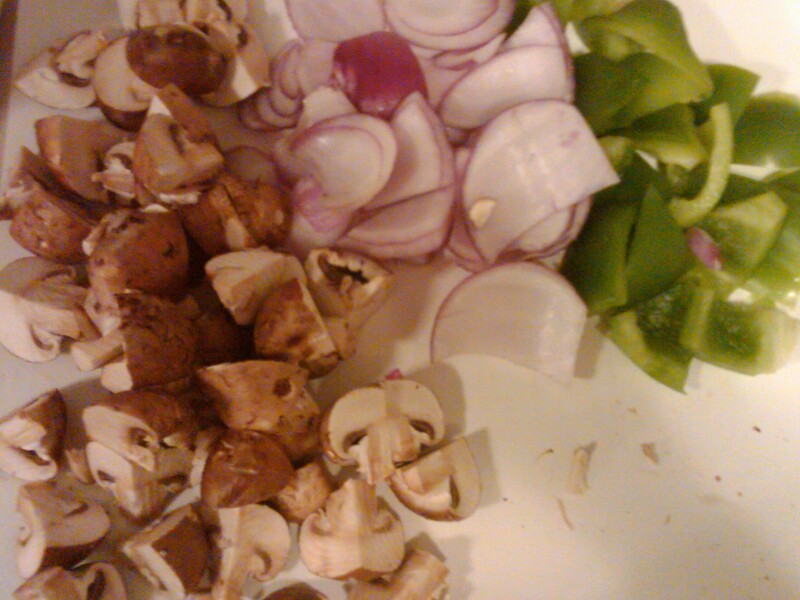 And decided to also roughly chop up my baby bella mushrooms. I conservatively drizzled sesame seed oil over them, and seasoned them with salt, pepper and garlic powder, then lit the grill to let it warm. 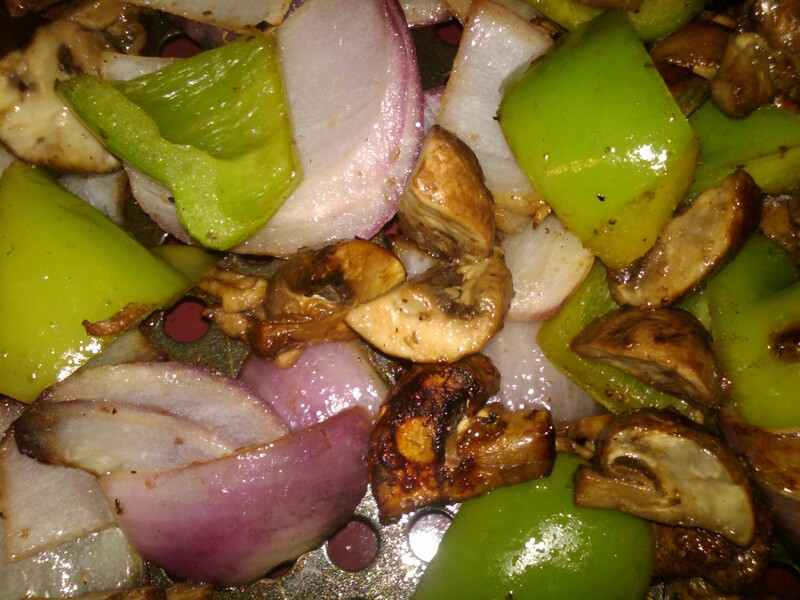 My roughly chopped mushrooms, onion and green pepper. We don’t need no stinkin’ skewers! Meanwhile I flipped my steak in the marinade. I scavenged through my pantry and found some udon noodles, which were conveniently pre-portioned (by the manufacturer) in approximately 2 portions. I also had to choose from plain old “Oriental noodles,” pho noodles or even spaghetti or angel hair pasta. I think all would have been good, but I’d lean toward the udon, Oriental or pho, if you have them. If you don’t have anything other than plain pasta, Wichita has lots of Asian markets. I reviewed Lucky Market a few months ago, and was surprised by how expansive their selection was. But even the smaller markets have a fair variety of noodles. I recommend you make a trip. You can also get similar noodles at most grocery stores with Asian sections. OK, so I as I’m bringing my water to a boil, I realize the grill’s probably warm (I’m a gas grill girl). I decide my vegetables probably need to cook longer than I’ll want to cook my steak. So I take the pan out, and turn the grill down to medium-low and toss them on. The smell…. Oh the smell. 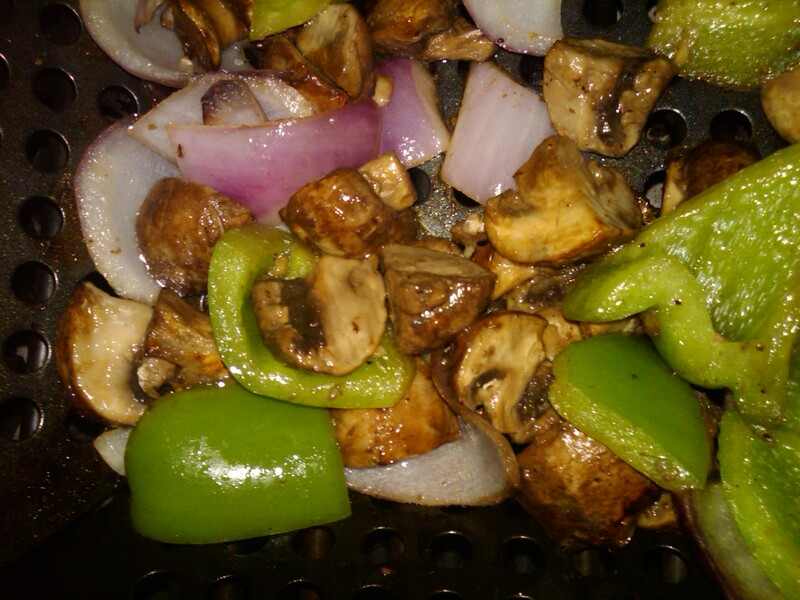 I love the smell of grilled veggies. It’s so simple, so delicious. Grillin’, grillin’, grillin. Get them veggies cookin’. Delicious! Back in the house, my water came to a boil and I dropped in the noodles and stirred to make sure they didn’t stick to each other or the bottom of the pan. I ended up adding just a drizzle of sesame oil to make sure they didn’t stick since they were supposed to be soup noodles (and therefore cook in a lot more water at a lower temp). I finally threw my steak on the grill. And was nearly attacked by a grasshopper the size of my left food. Damn! I’d never seen a grasshopper that big before. It nearly ate my steak. Back off, grasshopper. No bugs are invited to this feast! Ding! Noodles are done! 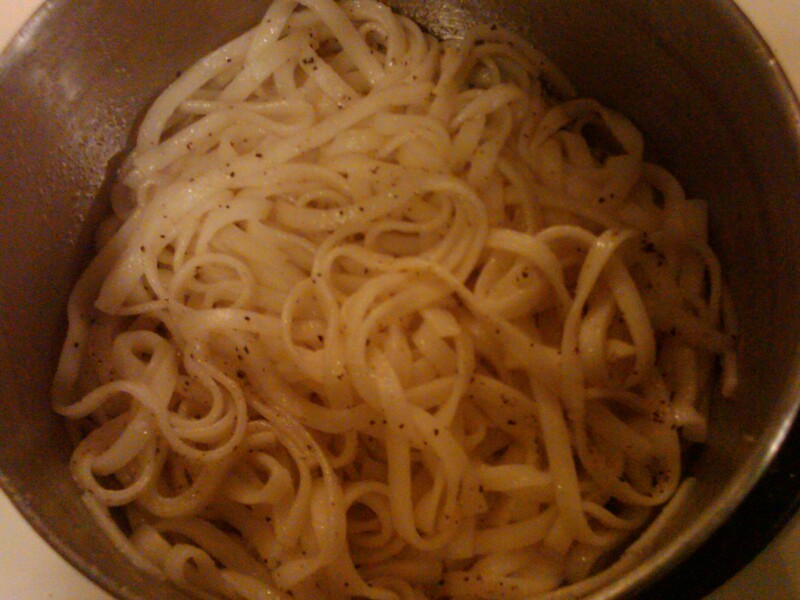 A taste test proved they were already naturally salty, so I seasoned with a little black pepper. After my near-death experience with a grasshopper (all you PETA people out there will be happy to know I merely scooted the big fella off my deck, I didn’t step on him – mostly because I didn’t want the carnage on the floor of my deck, but nonetheless no bugs were harmed in the making of this dish), I realized I wished I’d put my steak on before the veggies so I could have appropriate grill marks. Normally I bring my meat to the grill and turn it from high to medium-low/low just as I add the meat. Dad’s not going to be impressed with these results, I already know it. Oh well. The veggies smell good, at least! 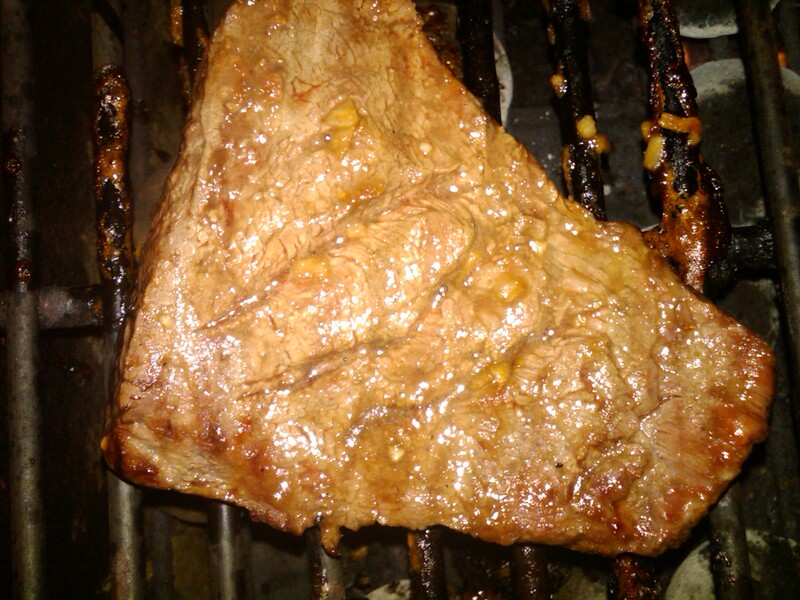 I let everything cook for five or six minutes, and when I flip the meat I can’t live with my grill mark-less steak. I jump the temp from medium low/low back up to high. And remove my mostly-done veggies (as to avoid burning) from the fire. I let it sear for just a few minutes and drop it back down to low. Yes, aesthetics are important to me. I can’t help it. My freshly flipped steak, sans grill marks. Sad face. A close-up to prove there are no grill marks. The edges look like they tried really hard. My veggies, on the other hand, are nearly as perfect as veggies get. Finally I deem my steak done. I don’t have a thermometer or anything. I normally aim for medium rare and can tell mostly by pushing on the meat how well done it is. Or, in my case, how very little done it is. 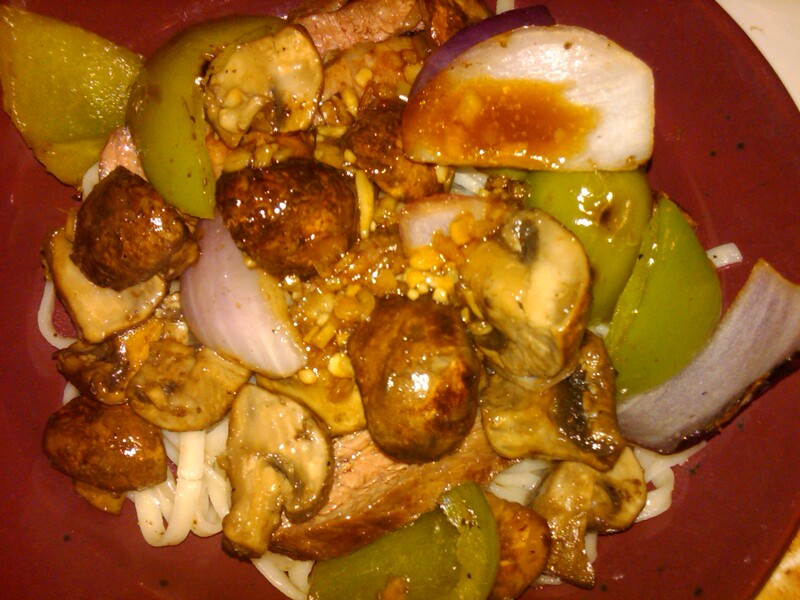 I set the meat on my cutting board to let it rest for a few minutes and dish half of my noodles into a bowl. And I snag a grilled onion. Using my tongs to hold onto my meat, I cut it into slices. PERFECTION! I don’t claim to be a master griller, but this looks delicious! I high five myself. The other side of the steak. Better, but not up to grill mark standards. Oh well, it looks juicy, and will rest for a few minutes. Why? I don’t know. I heard letting steak rests results in a juicer result. As the meat rests, let’s admire the veggies again. I put the meat on the noodles and am salivating with delight. I realize I’ve forgotten about my reserved glaze and pop it in the microwave for about 20 seconds to warm it. I top the meat with half of the veggies. And then drizzle with half of the reserved glaze. Note to everyone: This is the glaze I reserved BEFORE marinating. Not the glaze used in marinating. You don’t want to get sick and die from this delectable dish. Or, you know, in general. Noodles and meat. Add some snow peas and this is how the kansas.com recipe would have turned out. I’m glad I decided to grill lots of veggies instead of just using snow peas.OK, to be fair it would have also had the sauce. Which I forgot about (again) until I added the veggies. Adding the veggies and sauce. From start (making the marinade) to finish (my first bite), this dish was super-easy and took probably about 45 minutes. I’m guessing this dish has around 600 calories (I don’t know how kansas.com came up with under 300 calories?). 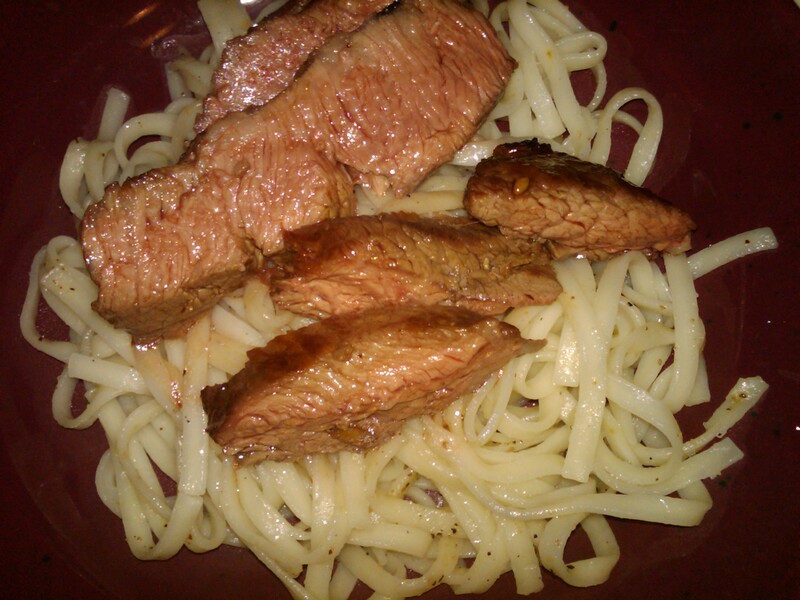 200 each for the steak (4 ounces) and noodles. 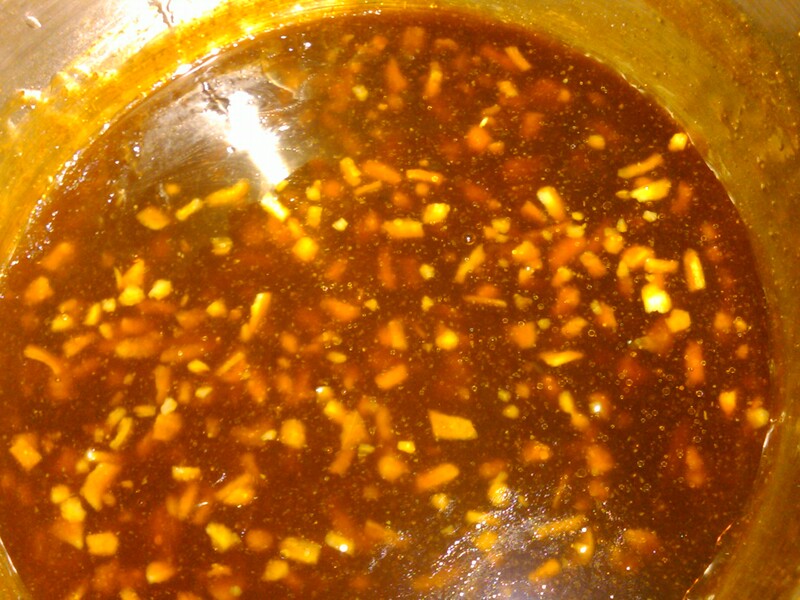 Probably around 50-100 for the marinade since it was also used as a sauce. And then 50-100 calories for the veggies since they were lightly marinated in oil. But totally worth it. And, oh. My. God. Delicious! Your eyes, nose and mouth will love this dish. A special shout out to Karla and Mat for opening my eyes to the wonder that is flat iron steak! First things first…Your pantry must be like the Macgyver of all pantries. Pretty sure my pantry does not include all ingredients to create this dish. High five to you. Secondly, aside from my hatred for Geese the Grasshopper ranks in the top 5 hated creatures ever. Not because I don’t like bugs or are afraid of them, because they are unpredictable. You never know when they will hop or where they will land…unpredictable, therefore not to be trusted or liked. Third, can I come live with you? You make way better food than Ryan…well and me for that matter. Just when I think I’ve made progress on becoming a domestic goddess you go and make something like this and smack me back to reality…Goddess i am not. Domestic or otherwise. Insert sadface here. But on a happy face note, this looks AMAZING. Minus the homemade teriyaki, because of the forementioned pantry problem, I think I might have to give this a whirl. Happy Wed. Sorry for the novel. Go in peace. LOL! “Go in peace.” HAHAHAA! I never considered myself well-endowed in the kitchen department. But I’m comparing to Mom, who has everything. She has a full cabinet and a half dedicated to just spices and whatnot. I was actually surprised at how good it turned out. 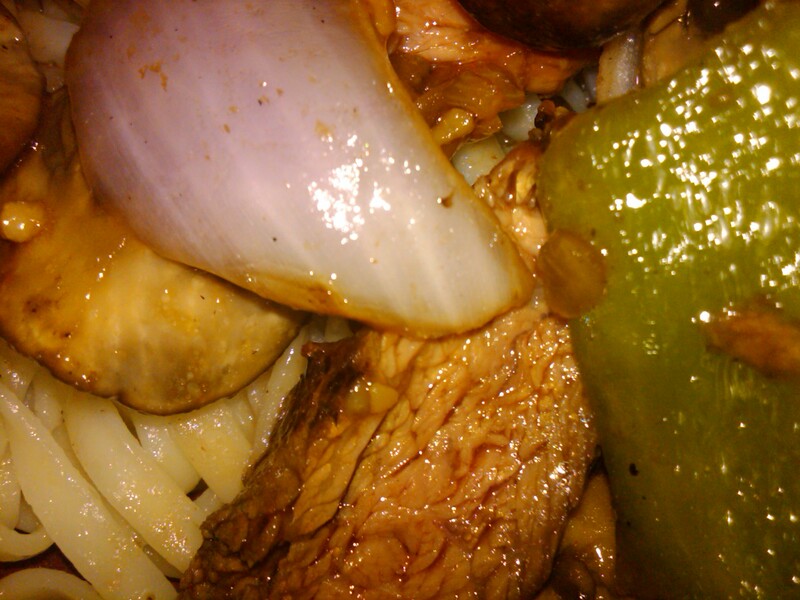 In fact, the dish started with bewilderment when the teriyaki was so easy to make and actually smelled like teriyaki. I expected it to smell, well, weird. Grasshoppers can also latch. So not only are they unpredictable in where they’re going, but you never know what they’ll latch onto. If my flight (out of the options of fight or flight) reaction hadn’t taken over I would have taken a picture of this monsterous beast. I either have never seen a grasshopper, or this is the first one I’ve seen that’s on roids. And I also expected you to give the obligatory “rim job” response to this article. I almost took the “pacific rim” out of the title. Yes, I know it’s a location. But I’m too immature to not take advantage if you’re gonna tee it up for me!